A bevy of unique, homegrown stores and upscale, yet accessible, restaurants makes this a go-to destination, whether you’re shopping for one-of-a-kind finds or the makings of a date night. The best attractions are around State Street/Illinois Route 38 and Third Street. Three floors filled with floral arrangements and home decor, including area rugs, furniture and seasonal items. Wander upstairs for a view of downtown and lots of room decor ideas. Specializes in all things paper, from wedding invites to notebooks and greeting cards – with a gag gifts section, for good measure. You’ll find lots of farmhouse chic and repurposed accents at places like Circa and Robins Nest, but you’ll find, authentic vintage treasures at places like Geneva Antique Market and Antiques on State. Gift ideas and surprises abound in this quirky old home. Look for custom furniture and decor, baby gifts, handmade soaps and gifts aimed at the hard-to-please teen. For a more casual setting, try Gia Mia Pizza, Geneva Ale House, or Barrel + Rye. For a more classy white tablecloth experience, try Wildwood or FoxFire, and for something in between, try Mexican-inspired tastes at Bien Trucha. 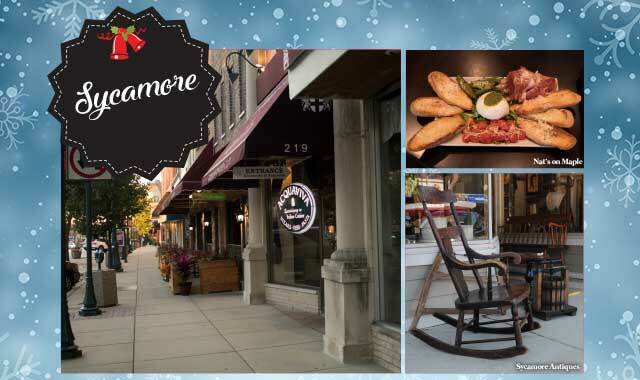 Bonus Find: If the recipient of your holiday generosity is fond of nightlife, send them on a night out in downtown St. Charles. Start them off with dinner at The Finery, where local ingredients and seasonal selections dominate the menu. Or, send them with tickets to The Arcada Theatre, a former movie house that welcomes rock ‘n’ roll legends almost weekly. Upscale boutiques dominate the landscape downtown, but there are many surprises scattered about – if you know where to look. 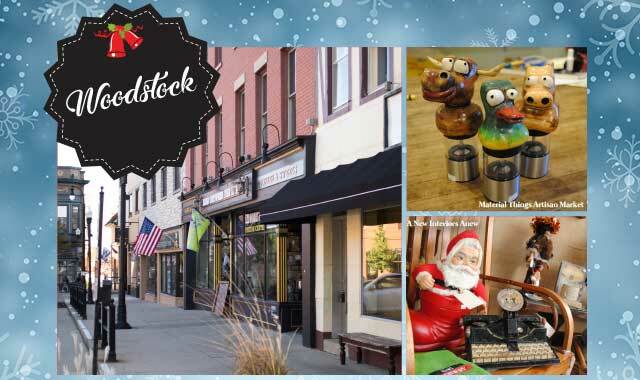 Go hunting twice when you visit these 10 stores in and near downtown Barrington – once, as you distinguish these shops from their industrial neighbors and again as you browse among these antique, repurposed, vintage and consignment goods. A converted ice house sets the stage for cozy shops, a spa/salon, antiques hunting, a microbrewery and a restaurant where you can dine in an old rail car. 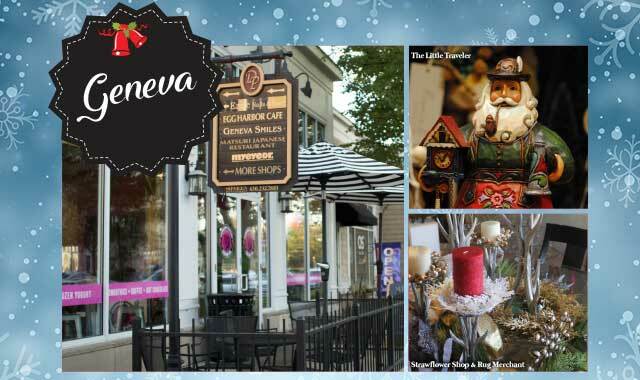 Salons, ladies’ boutiques and jewelry stores proliferate around downtown Barrington. 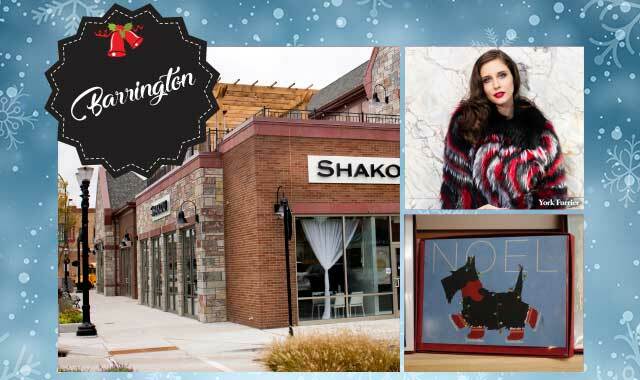 Try Heads Up Boutique for custom apparel and Barrington Broncos gear, or shop Angelina for eclectic gifts and accessories. For a more high-brow style, choose a handmade piece of jewelry at M.J. Miller & Co. If it’s not made in the U.S. it’s not to be found at Deborah Leydig’s store, which takes the term “general store” to a new level. 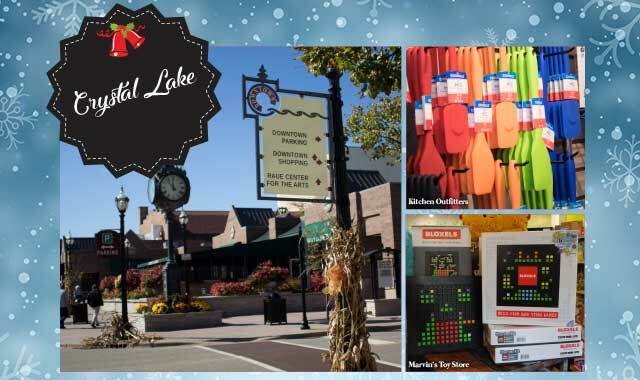 Inside this charming red-clad building you’ll find holiday items, clothing, kitchen items, greeting cards, kids’ toys – pretty much everything you can make in the States. Grab brunch at Egg Harbor Café, lunch at Neoteca, a snack at Gnarly Knots Pretzels, and dinner and drinks at McGonigal’s Pub or Shakou Sushi. Bonus Find: OK, so we said no malls, but The Arboretum of South Barrington boasts a nifty selection of high-brow retailers – many of them national chains, but some homegrown enterprises, too. Most of these stores specialize in apparel (Evereve), home goods (Britt Carter), and dinnertime fun (Pinstripes). The small, but concentrated downtown business district is a lively place on the weekends, with bustling restaurants, a performing arts venue and numerous family-owned businesses. Start on Williams Street, but be prepared to fan out to the surrounding blocks. Stylish attire awaits inside Wear Did U Get That, a boutique that really does cater to women of all ages. Up the street, La Bellissima specializes in bra fitting, attractive undergarments and comfy wear for women, especially those in plus sizes. Satisfy someone’s sweet tooth with handmade chocolates from Mellie’s Chocolate. The sea salt caramels are a must, and allergy-free options are available. KaleidoScoops is best loved for its ice cream, but it also serves up cakes and pies. Numerous stops cater to those looking for home decor and accents. For something fun, stop by Out of the Box. For something glittery, visit Wickham Interiors. For something more contemporary and plush, try Yours & Meyn. Stock up on kitchen gadgets and gourmet foods at Kitchen Outfitters. Give a gift of entertainment with tickets or a voucher to this performing arts venue, where big-name stars like Garrison Keillor take the stage and McHenry County’s only Equity theater troupe performs. Grab brunch at Benedict’s La Strata, munchies at Grounds Coffee Bar, pizza at Georgio’s, and dinner at Duke’s Alehouse, where most dishes are locally sourced. Afterward, grab a fresh-brewed beer or some beer gear at Crystal Lake Brewing. Bonus Find: Satisfy the wakeboarder on your list with passes to The Quarry Cable Park & Grille, located at Crystal Lake’s Three Oaks Recreation Area. The North Lake at this former gravel pit is equipped with a cabled wakeboarding track and a cool hangout spot for afterward. Call ahead before you visit – this summer hangout maintains limited hours in the offseason. The charming square has been many things, including Punxsutawney, Pa., in the Bill Murray film “Groundhog Day.” Its quaint architecture and cobblestoned streets really glow during the holidays. Glass artist Ken West displays his whimsical wares alongside the works of nearly 90 regional artists who share his appreciation for colorful everyday art. McHenry County’s only locally owned bookstore specializing in new titles is a joy for voracious readers. The shelves display a variety of genres, but if you can’t find it here, just ask and someone will help. Bring the kids along for storytime, too. This longtime florist creates colorful displays for every season and usually stocks arrangements and gift baskets to go. Ask about colorful accents, like collectible ornaments and lanterns – both of which look great mixed with flowers. Take a trip to the American Southwest and discover a colorful combination of Native American jewelry, antiques, minerals and crystals, and handmade leather goods. All leatherwork is custom-made in-house. Warm up with a hot cocoa or fresh treat from Ethereal Confections, where all chocolate is made from freshly cracked cocoa beans. Grab one of the unbelievable burger combinations at D.C. Cobb’s or dine in a former jail cell at Public House, at the Old Courthouse. Bonus Find: The legendary Woodstock Opera House, where the likes of Paul Newman and Orson Welles once trod, still welcomes performing artists and community theater groups most weekends. Across the Square, the beautifully restored Woodstock Theatre shows first-run movies on multiple screens. Before it was beloved for its wedding venue, this beautifully restored industrial property was revered for its lush garden center, which still operates year-round. This season, look for holiday and home decor as well as workshops for the cabin-fevered gardener. Bonus Find: Have fun with the family and support a worthy cause with a museum membership at Midwest Museum of Natural History. Starting at $35 a year, memberships provide free admission all year, in addition to perks like members-only events, reduced fees and guest passes. This entry was posted on Friday, November 3rd, 2017 at 12:00 pm	and is filed under Features, Top Posts. You can follow any responses to this entry through the RSS 2.0 feed. Both comments and pings are currently closed.